Second full-page Illustration for Dickens's A Christmas Carol in Prose: being a ghost story of Christmas in the Ticknor and Fields (Boston), 1869, Diamond Edition. Adding to this textual moment, Eytinge includes the clerk's stove (right), white scarf ("comforter"), and flaring candle on his copy desk. In his right hand he carries a poker while keeping his left in his trouser pocket for warmth, having tucked his quill pen for convenience behind his left eye. The walls and floor boards, as one expect of Scrooge's office apartments, are entirely bare. 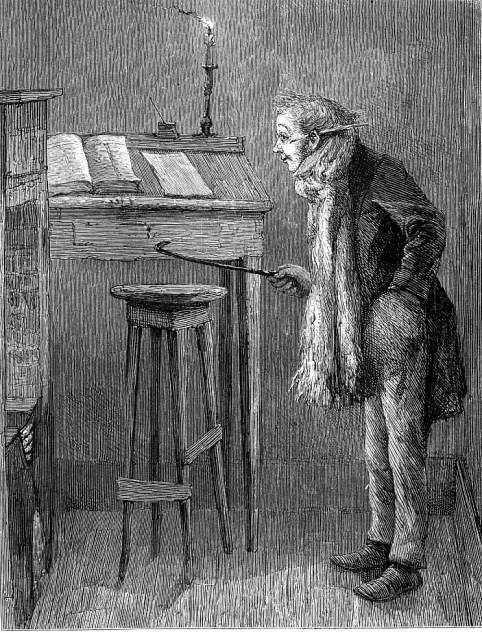 Regarding Eytinge's study of office clerk Bob Cratchit, one has the impression that he is cheerful in spite of his less than pleasant working conditions.